Stainless steel components for saltwater use. Colour anodized finish – available in red, blue, or black. * Naturally we want to run down the stocks of spare spools with the sales of reels so we have priced some ‘”Sea Venture” reels as a package. We do have a limited number of extra spare spools for the Sea Venture range but not for the 4½ inch E.W. 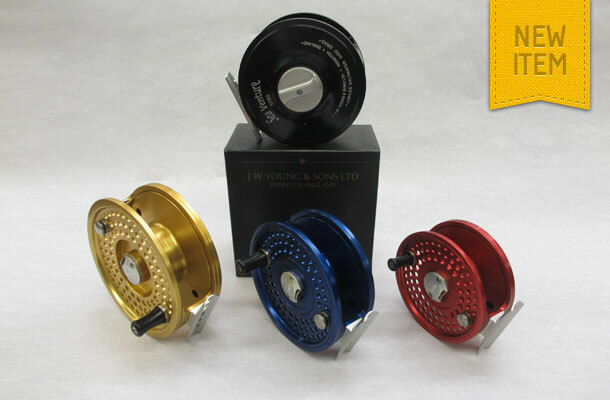 3 ½ “ available in either Blue, Black or Red with colour matching spare spool. Standard spool capacity – WF-8-F plus 200 yds of backing. Large Arbor spool capacity – WF-7-F plus 150 yds of backing. 3 ¾ “ available in Black or Gold colour. No spare spools available. Capacity – WF – 8 – F plus 200 yds of backing. 4” available in Blue, Black or Red with colour matching spare spool. Standard spool – capacity WF – 9 –F plus 250 yds backing. Large Arbor capacity – WF-9-F plus 175 yds backing. Postage and insurance at cost.